If in this case “sauce” means psytrance, then yes, it is most certainly a Return to the Sauce. 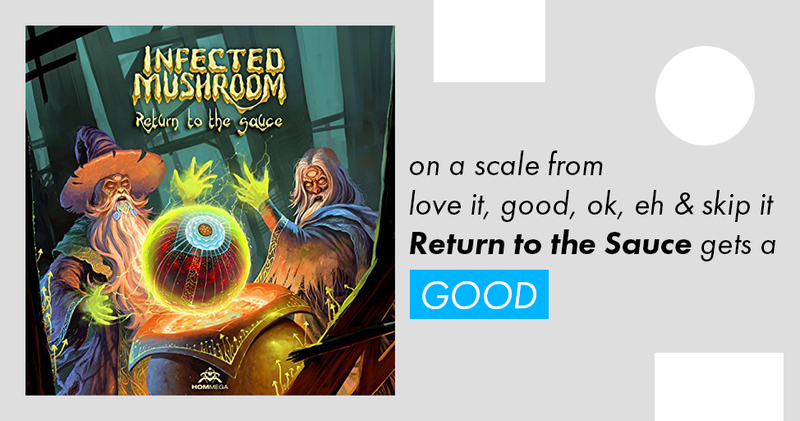 Infected Mushroom‘s 11th studio album has them moving away from their ambient-sounding Converting Vegetarians series, and revisiting the work that made them initially popular. Although they don’t immediately show it. “Flamingo” and “Manipulator” are used as a sort of warm-up before accelerating the listener to a combustible 140 beats per minute. It’s a necessary progression; especially when the Israeli duo, Erez Eisen and Amit Duvdevani, see a higher purpose when putting together an album. It’s about the voyage, the usual strange one, that propels an imagination one can only hear. The opener, “Flamingo,” which was featured on Monster Bunker #2, feels as if we’re spies trudging through an RPG-like terrain. You just don’t know where it’s going; however, it makes sure to work itself around by circling back to its starting arrangement. It plays the vocal distortion carefully, keeping some of it natural, and flexes the mind for a harder auditory experience in the songs to come. The title track, which parodies Lord of the Rings in name and cover, blasts off on a string of punches through an adventurous, Pirates of the Caribbean-esk, soaring synth. Its power never slows down and even continues for the remainder of the 9-track LP. While many of the tracks contain it, “Groove Attack” expands on the duo’s humor in combining happy-go-lucky vocal exaggerations against eerie backgrounds. It’s nice to know, even when deep inside a trance, that they’re able to resist getting too serious. Notably, two tracks in the middle are remixes. “Gravity Waves” is a remix of a remix they did back in 2000 and “Demons of Pain (Remix)” is a rework of a track from their Converting Vegetarians II LP in 2015. It’s unusual to see a remix, or rework, implemented in the composition story. But the feeling they instilled in the original tracks never fades while passing through them. Not to mention, the statement they make by including a track from an album resulting in a ‘different’ genre. It’s a subtle argument being made against fans who believed that they wondered away from their origins, or “sauce.” In their consideration, it has always been an experimentation with the original sound. Return to the Sauce may be yet-another peculiar story; but their analysis of sound structures when telling this one differs from previous works. It’s more adventurous and secure in its cohesive direction. So much so that a one hour mix of just these tracks appears at the very end of this otherworldly journey. GOOD.